HIGHS AND LOWS – SEASONS CHANGING! Water – still warm! Low to mid-80’s although air temps are sometimes cooler than the water temp! Fishing – Really having to hunt and search these days. Some days good. Some days not so good. Some boats do good and boat right next to them terrible. One captain is hot one day and next day someone different catches the lightning in the jar. Fish are all confused with all the weather variables. It’s also affecting the bait situation and availability. However, mid-week, air temperatures started to rise. Humidity returned. The winds slowed down. And the fishing got way better…mostly…sometimes…compared to before! Outlook This Week – Supposed to get more and stronger north winds. Maybe even a tad of rain. 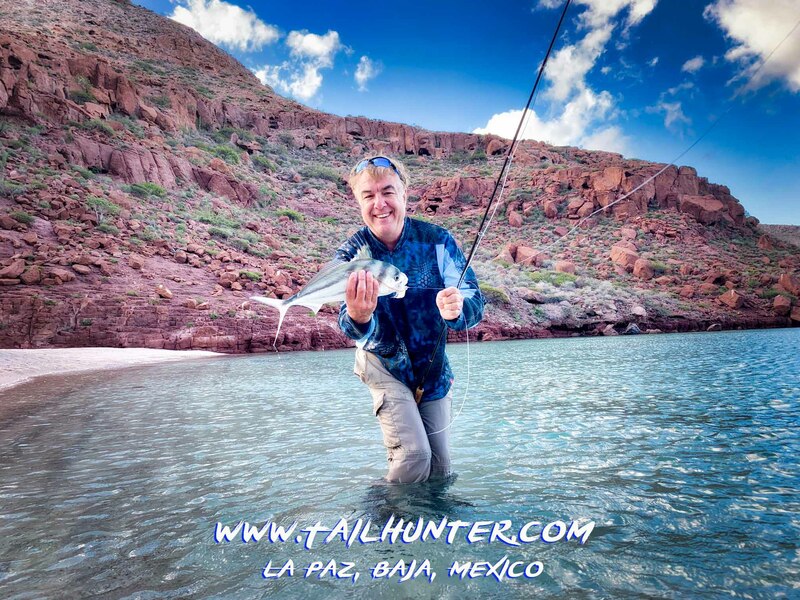 Might hurt the ability to fish with our La Paz Fleet if the northerns get too much stronger. If the cooling trend is sustained, then fishing will definitely change. Wow! 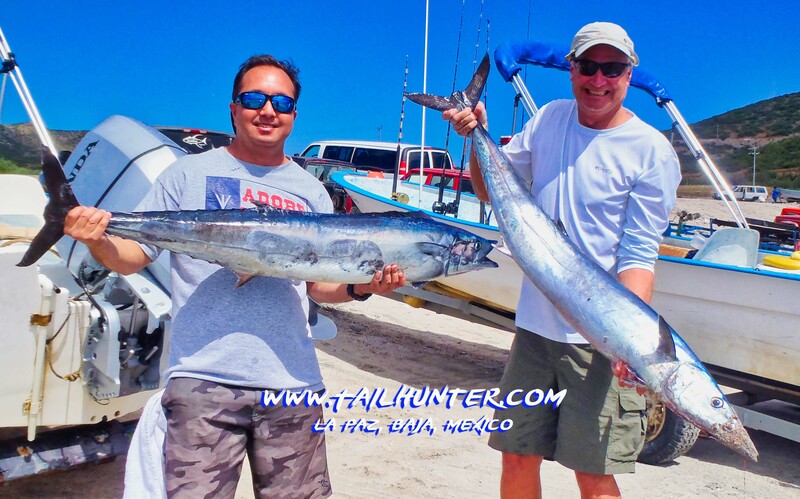 Great start for Craig Honkanen (r) and Ken Austad (l) and a double wahoo hook-up! 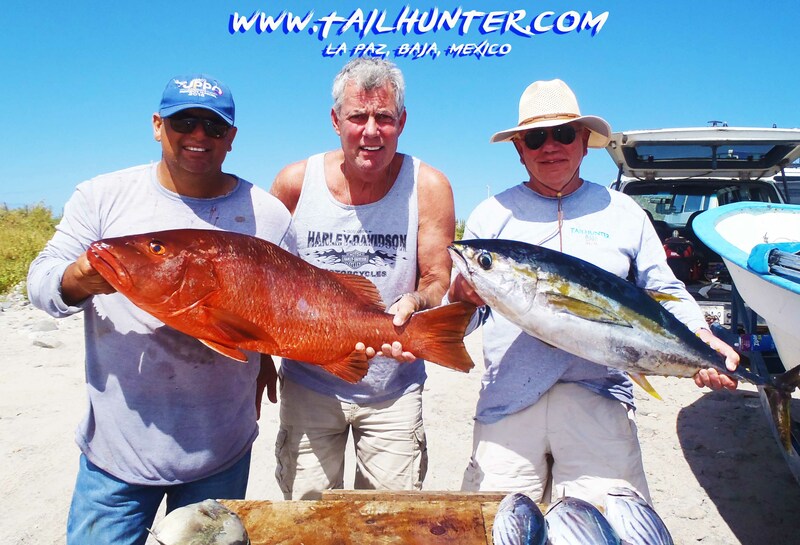 Fishing with their favorite Captain Armando, Bob Layko and Craig Brown from Washington visit us every year and started with a chunky dog-tooth snapper, a yellowfin tuna and some blue bonito! 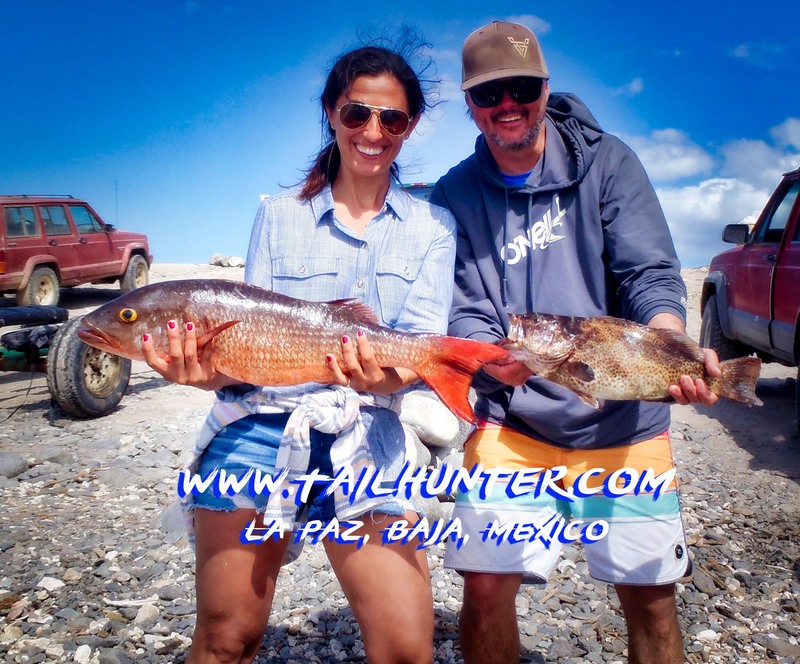 Laura Hernandez’ giant dog-tooth cubera snapper (pargo perro) that ate a whole bonito. 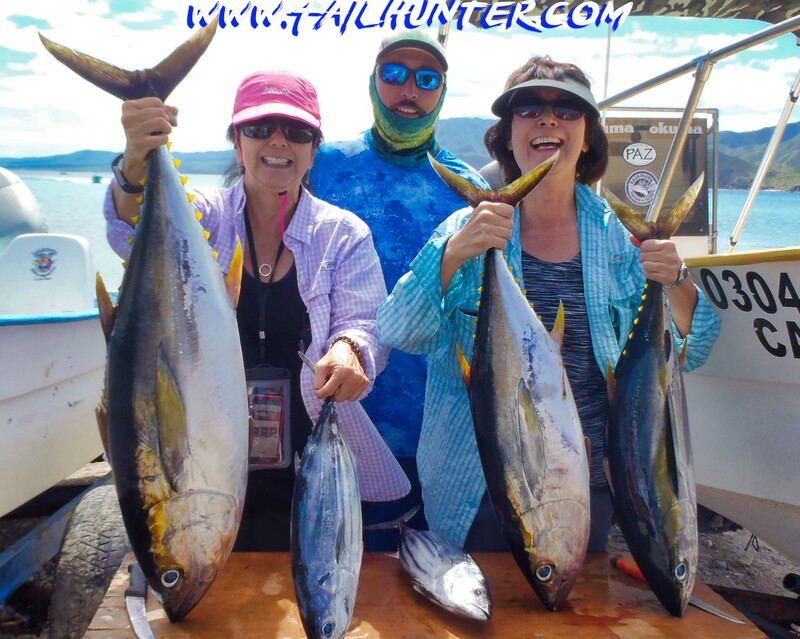 For two gals who had never fished in saltwater before, Margie and Debbie did pretty good on the tuna with Captain Pancho! 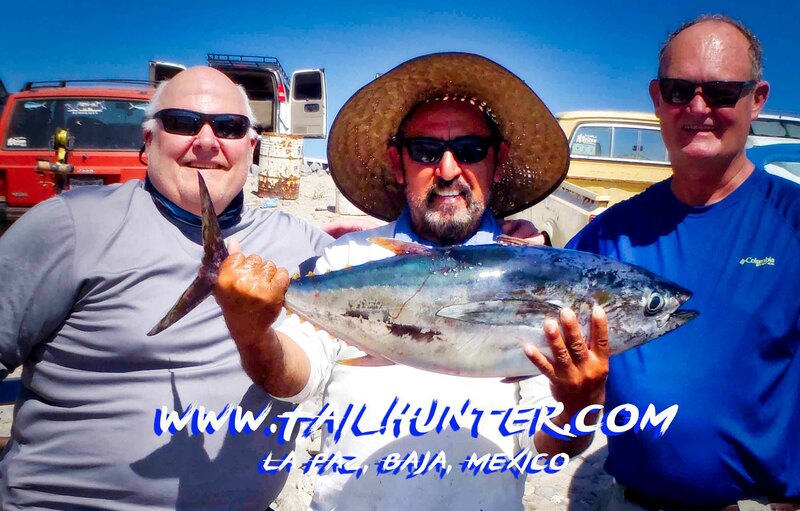 From Alaska, Brian Ginder posed with Captain Victor and one of the larger tuna and a bull dorado. Nice grillwork on this big pargo that Mark Buchanan has! And a face only a mother could love…the fish I mean. Mark is fine! 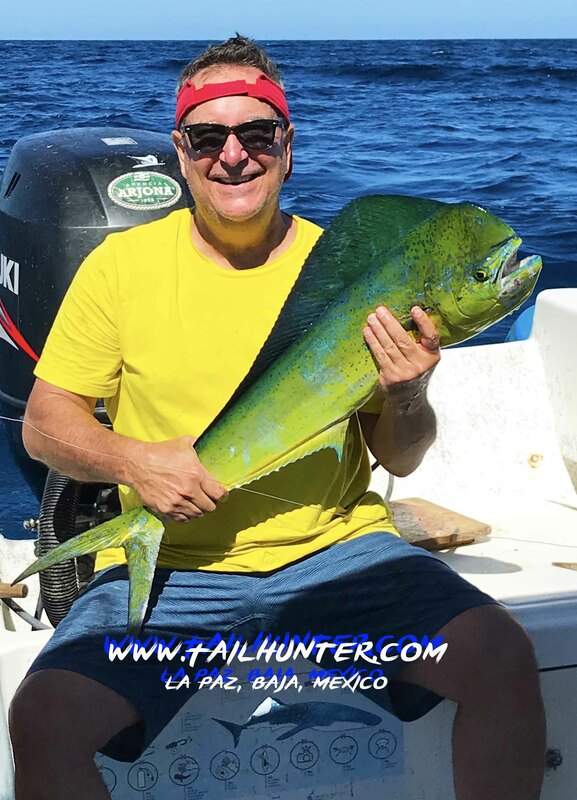 Dorado aboard the Esperanzas fishing out’ve La Paz with Captain Boli and Scott and Mike Atherly. I’d say Justin Jones and Mitch Gayman had a pretty good day with Captain Moncho! 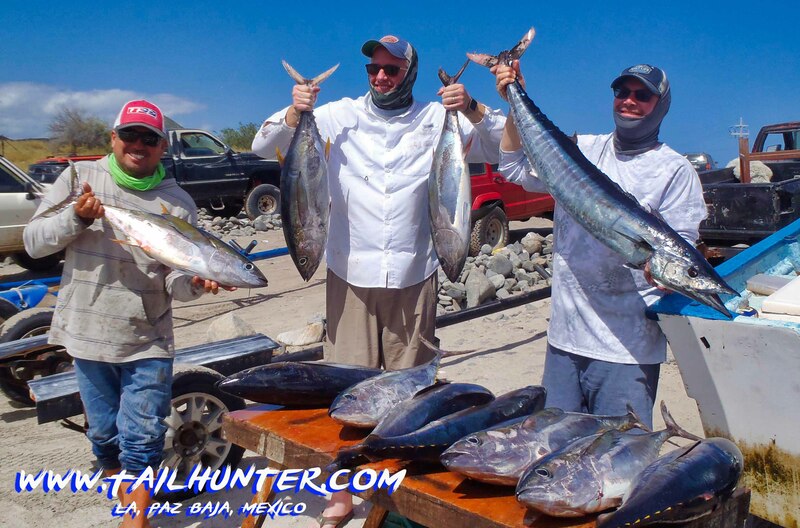 Check out all the tuna on the table and a nice wahoo as well! 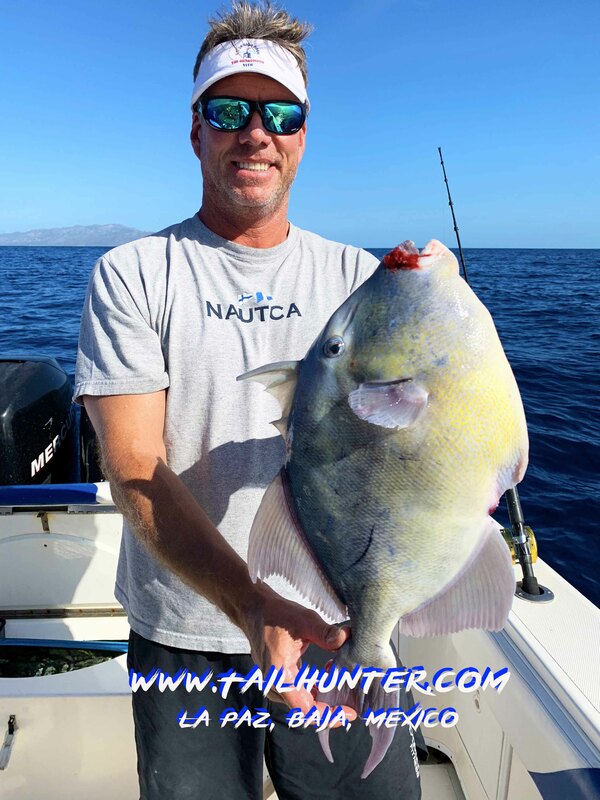 Is this the biggest triggerfish ever? 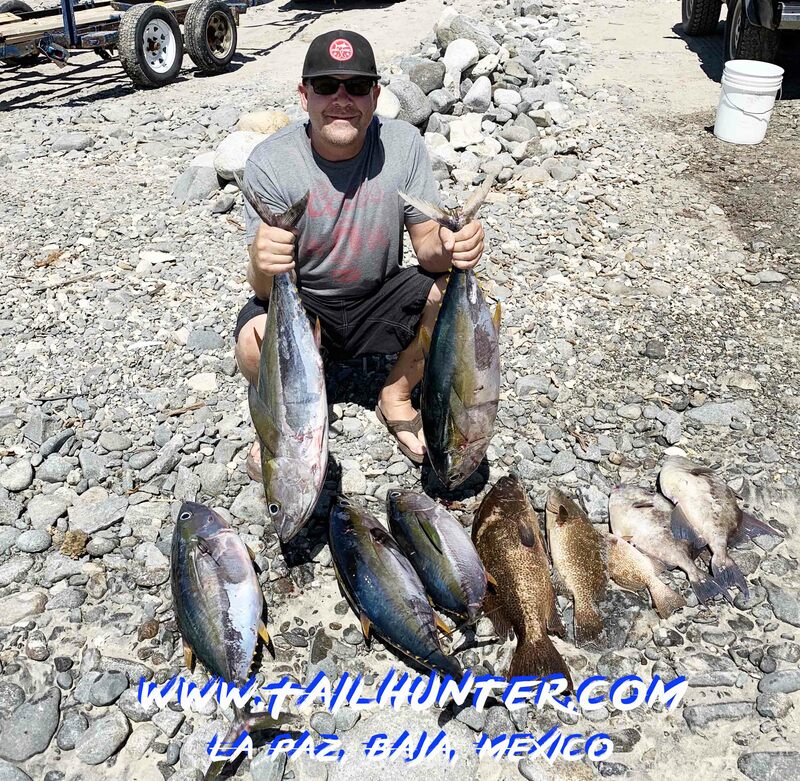 Jeff Ferguson from Colorado Springs CO. That’s alot of ceviche! 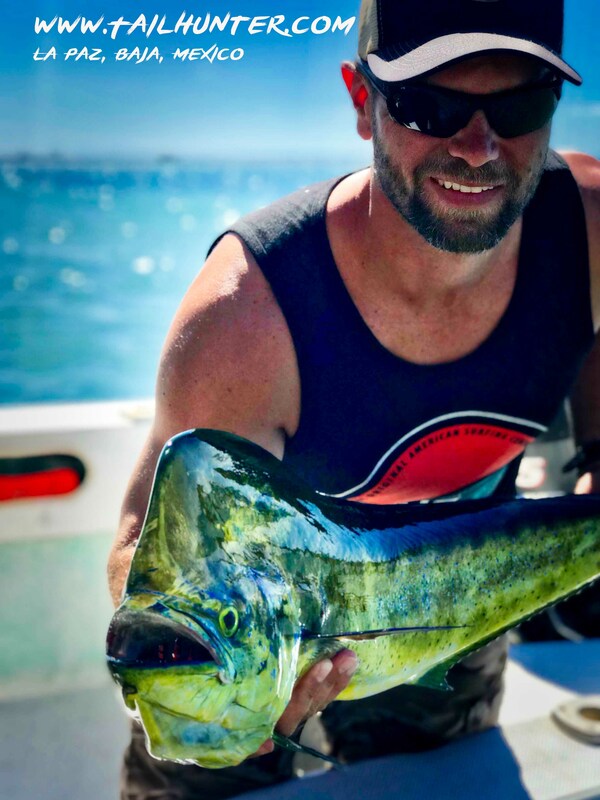 Steve Resky and the panga all to himself and rocked it with a solid day of tuna, cabrilla and big triggerfish! Maybe the prettiest photo of the week. It’s surely my favorite. 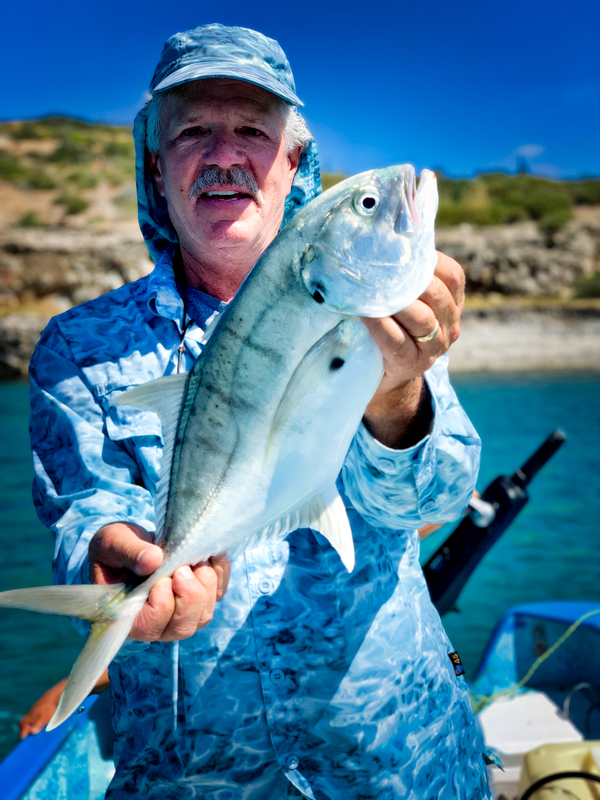 Taken by Jae Shin of John Daley and a flyfishing catch of a little roosterfish from the shore (released). John and Jae are from Anchorage, Alaska. 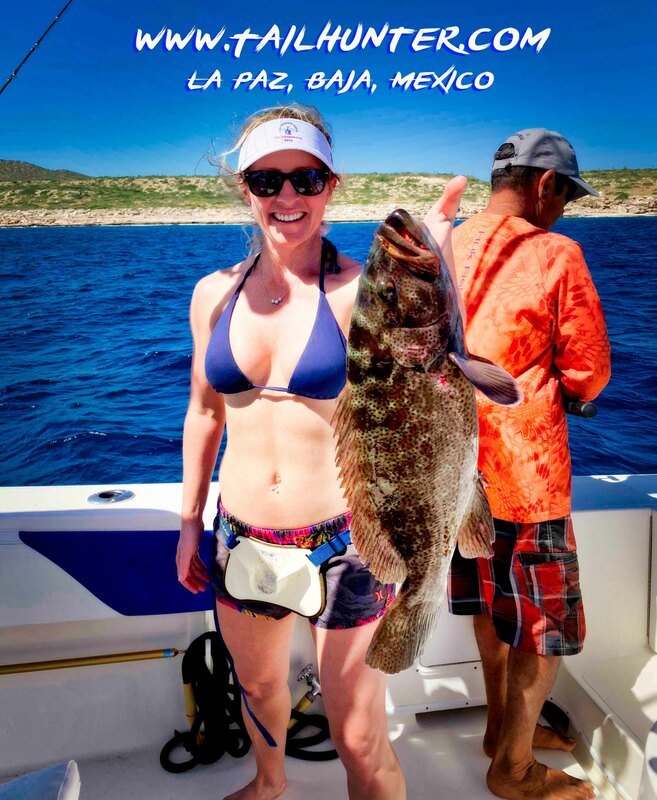 That’s a legit cabrilla, Jenn Wilson! Just outside of Bahia Muertos she’s staying out there at the Rancho Costa Resort. 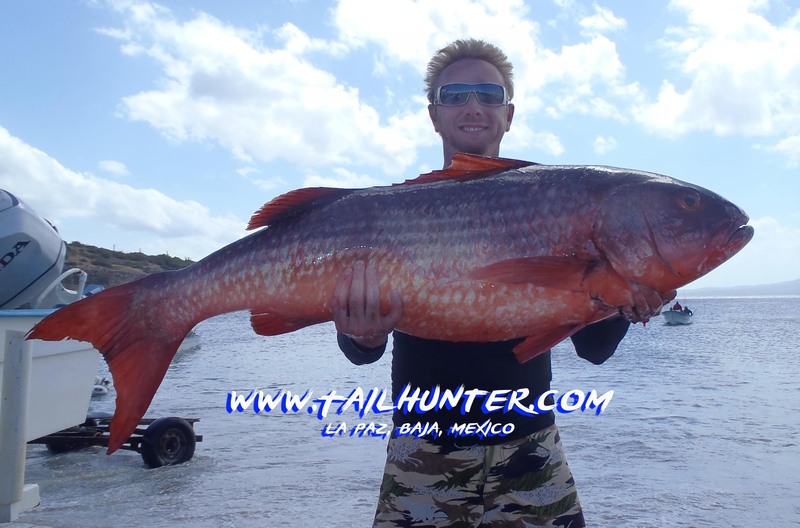 Geeze…that’s a big pargo! Steve McKellips from Arizona hung this gorilla just outside of Bahia Muertos. You gotta love Paige Resky! 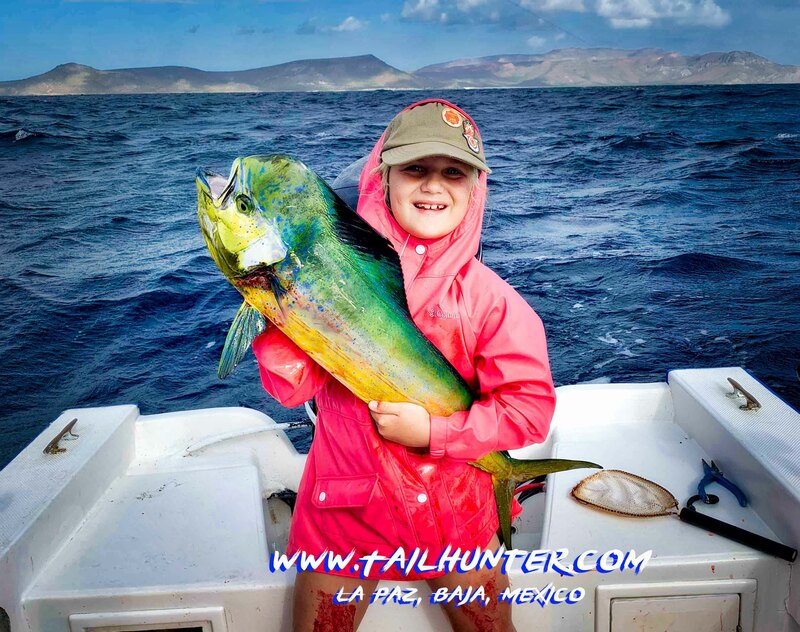 She’s 8 years old and in rough seas outside La Paz Bay, in her rain slickers with blood on her legs, she’s a gamer and holding onto her dorado! Nicely done, young lady! 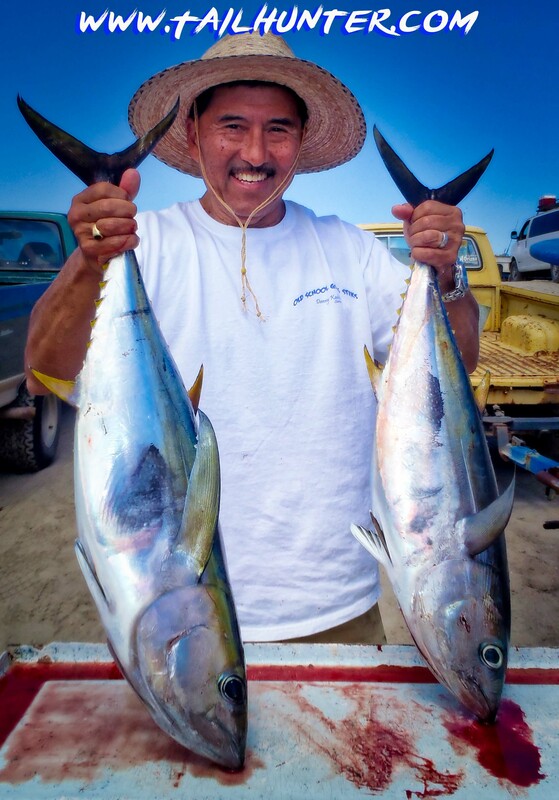 Captain Jorge has been fishing with our good friends, Jeff and Marianne Sakuda from Cypress CA for years. 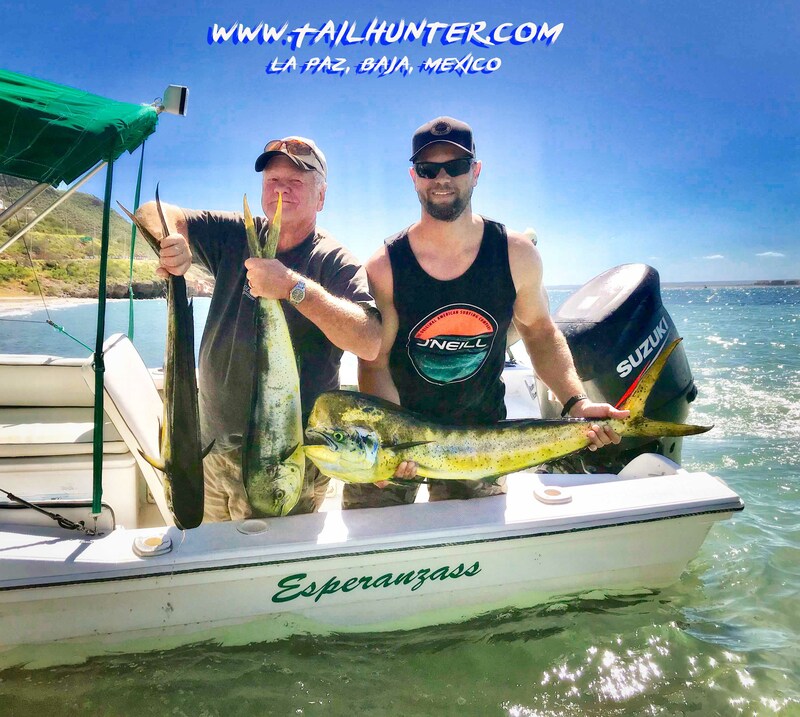 Matt and his dad, Dennis Gayman from Arizona had some nice tuna to bring back to the beach, among other catches this day. John! I told you that you’d get in this week’s report! Good day, my friend! You can’t beat the light tackle action in our area. 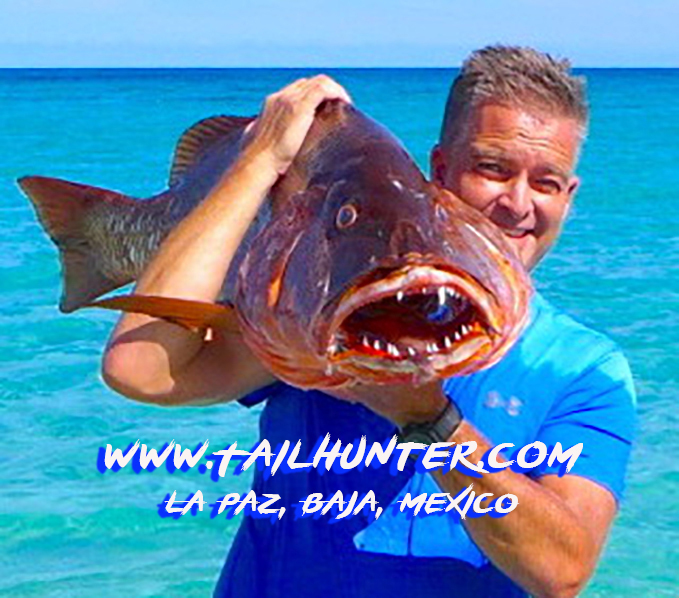 Gary Wagner had fun with his trout rod right in Suenos Bay and poses with a feisty jack. 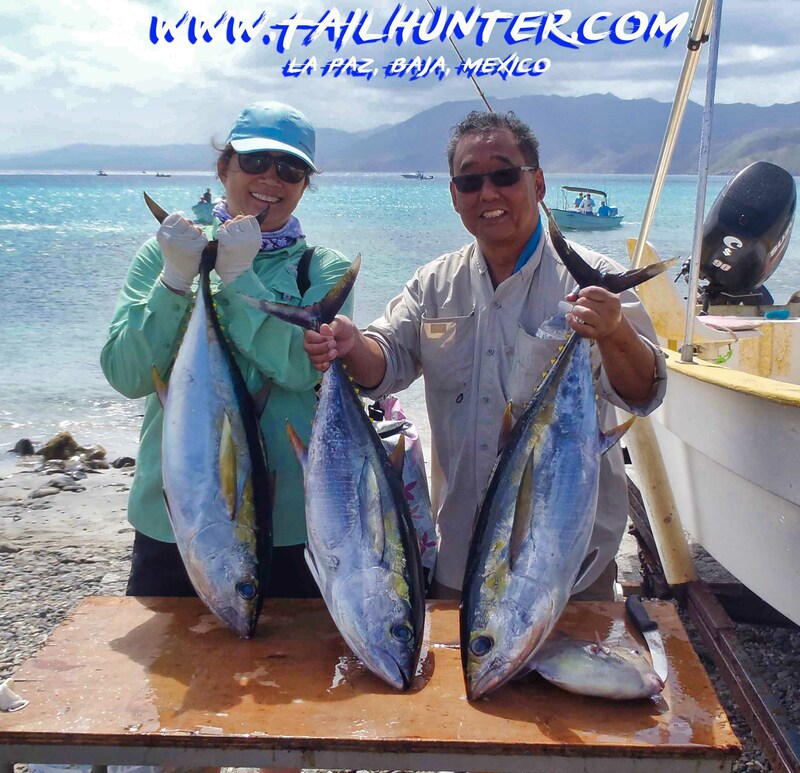 Pretty photo of our first-time anglers to visit us in La Paz, Marlene and Taky Kikuchi with some handfuls of yellowfin. 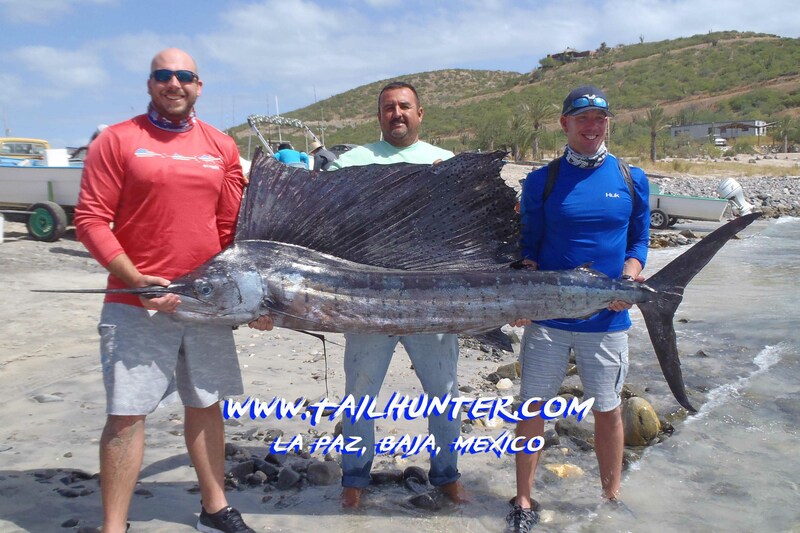 Noah and Justin Lauby with Captain Chavelon with one of two big sailfish they hooked at the same time that swallowed little sardines while fishing for tuna. Michelle and Mitch Allen show off some of the variety. 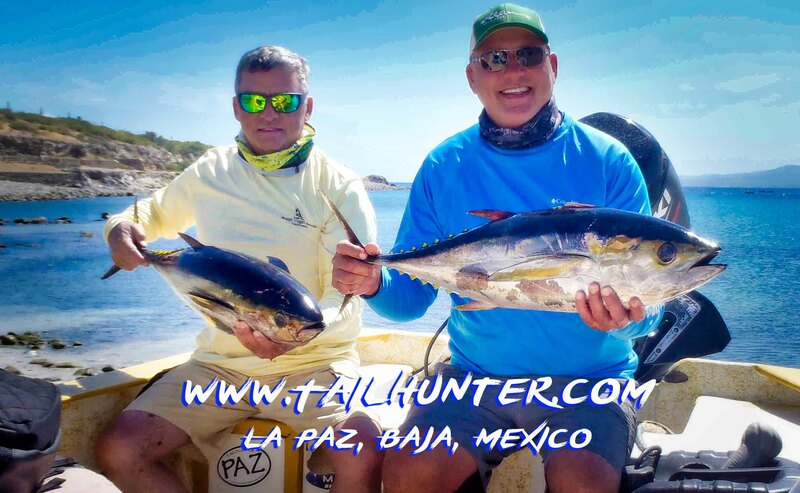 In addition to tuna, they also got these two…a pargo liso and a cabrilla. All great eating! The Allens are from Arizona. 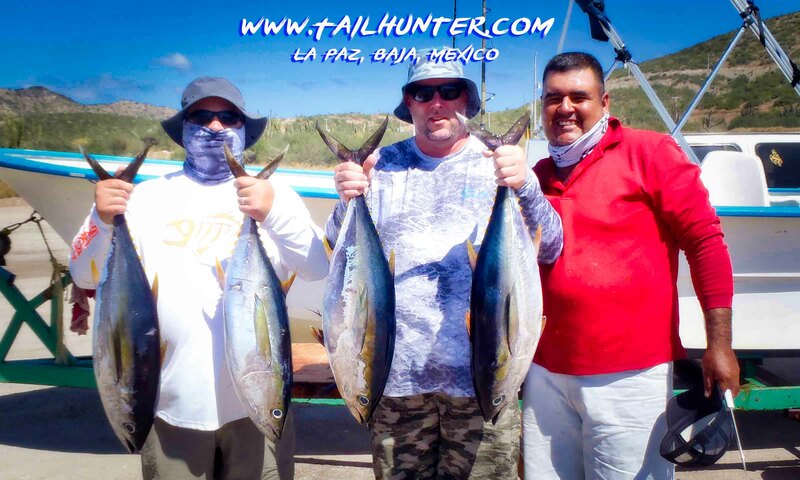 Our amigo, Jeff, and first-day yellowfin tuna! 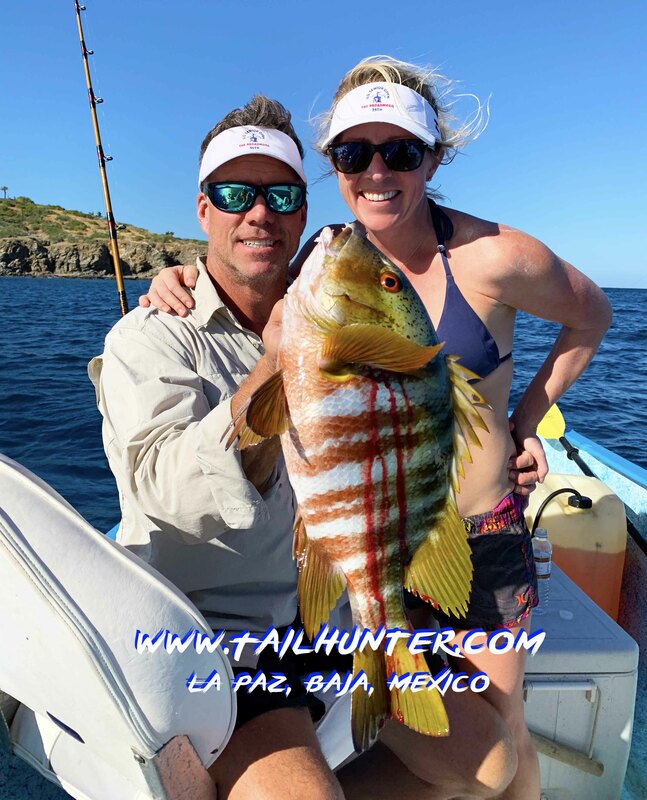 That’s a big barred pargo (pargo mulatto) and Laura Hernandez always seems to hook big fish. Craig Brown and cousin Bob Layko with their favorite Captain Armando. Nice wahoo, Bob! Jeff’s got a barred pargo off the rocks at Punta Perrico there in the background. 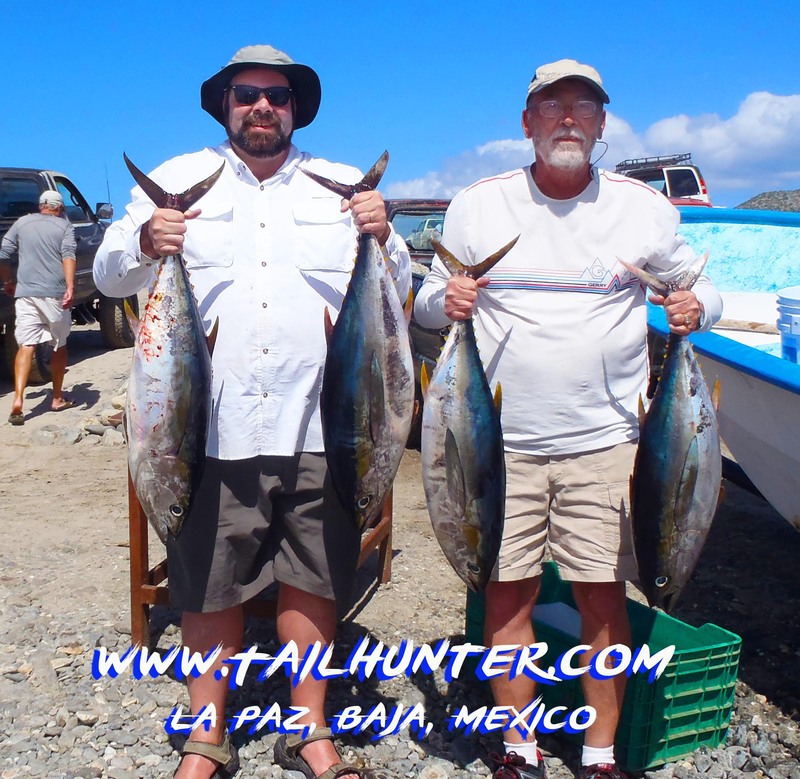 Steve and Bill from Oregon got a whole-lotta fish over 3 days including one of quite a few yellowfin tuna. Under the mask, I think that’s Brian Schwalbe and for sure that’s Chris Aiello with Captain Gerardo and 4 of their yellowfin. 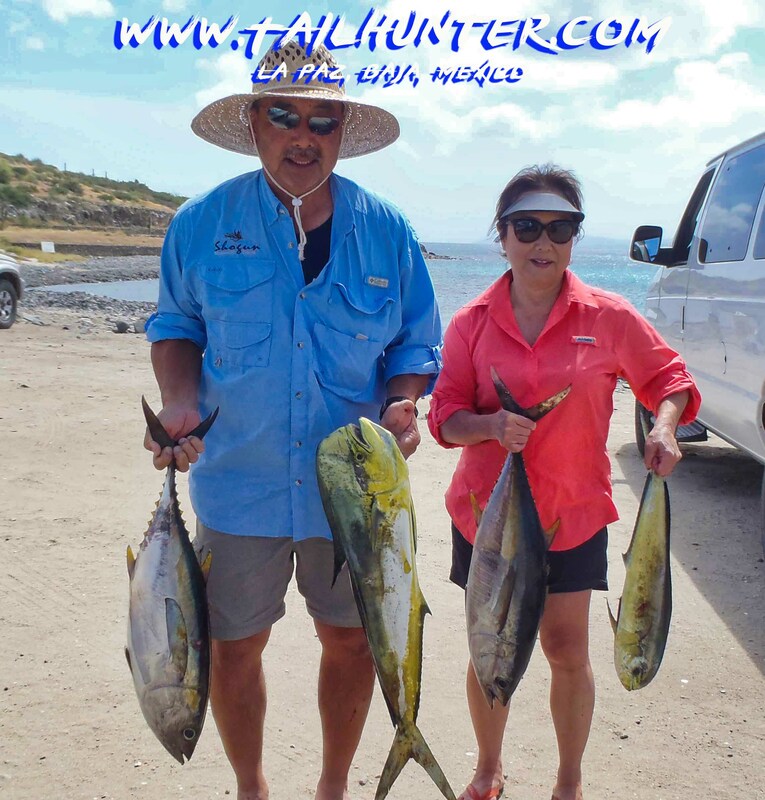 Grant and Juli Nakagawa made their first trip to La Paz this week and got some dorado and tuna. Really great shot of Mike Atherly and his dorado caught out’ve La Paz. He and dad had a pretty good day. 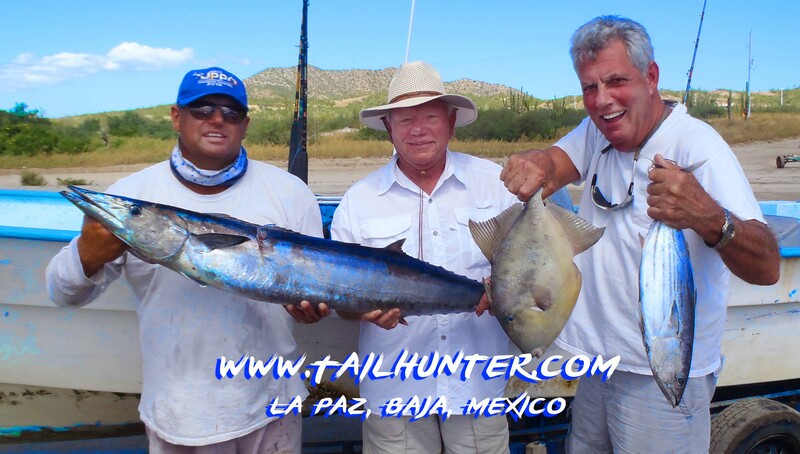 Our Florida visitors, Dave Wilson and Kurt Bertsch hung out in La Paz this week and took a few days to fish with us. Good guys! No big deal! 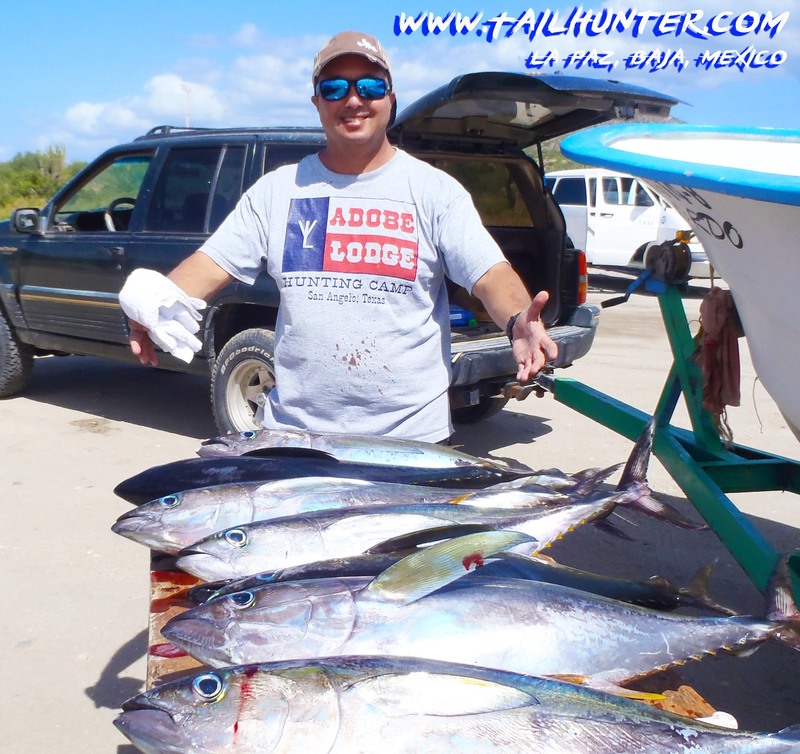 Ken Austad has himself a table full of tuna! Tim Gardner is somewhere behind that mask! 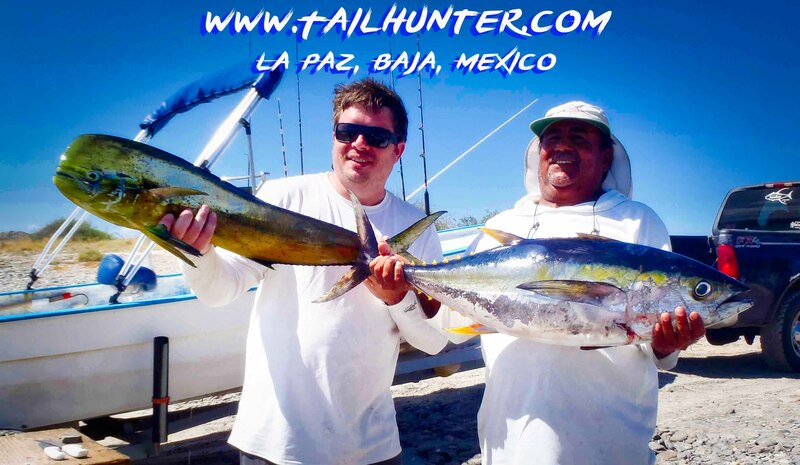 He had one day to fish and slammed pretty good with a number of tuna and this bull dorado. Two weeks ago the weather down here changed dramatically. Almost overnight temperatures dropped precipitously from the mid-to-high-90’s down to the mid-to-low-80’s! Humidity disappeared and the northern winds or winter started kicking up waves and chop. The fishing fell off drastically as well. After such a good long season, I was about to declare the season pretty much done. I figured the season had just ended a bit sooner than we expected because we normally don’t see these kinds of conditions until November. So, for about a week and a half, including the beginning of this past week, fishing was difficult. We had to scratch for everything we got. It was erratic at best. Rough waters…changing currents…winds…all contributed to an anemic bite. It also affected our ability to find live bait. Several days there was little or no live bait to be had! There were a few highlights here and there, but the chew was not what it had been. Some boats got skunked. But then, about mid-week, we had a change. The temperatures and humidity started to rise. The winds calmed down just a bit. Bait became more readily available. And little-by-little, the bite improved. A few more tuna. A few more dorado. Some wahoo. Pargo, big dog-tooth and cabrilla. Even a few billfish. Not what it had been, but a zillion percent better than two weeks ago and the beginning of this past week. It’s still a hunt right now. Some boats are doing better than others. Some captains are doing better than others. But then…the next day a boat that was hot now struggles. A captain that couldn’t get a nibble suddenly is on fire! There’s just no predicting. The captains are working hard to find the bite. Harder than they would normally have to as we adjust to the changing ambience of wind and water. There’s no doubt that the season is changing. Winter conditions have definitely started to move in earlier than we would have liked. THANK YOU ALL FOR MAKING A DIFFERENCE! 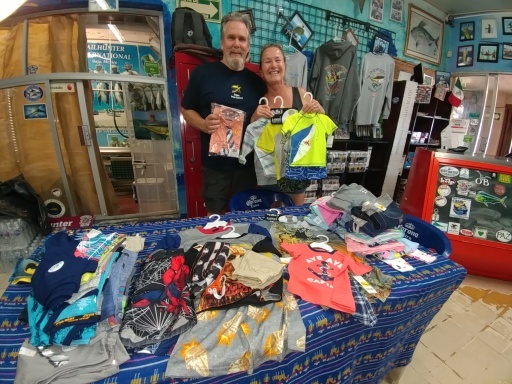 Celebrating her retirement, Dana and Lollie Milano came down with several loads of BRAND NEW clothes this week. As we wind-down to the end of another season…our 23rd down here…just wanted to give another high-five to everyone who brought down stuff for our Tailhunter Outreach programs and charity foundations! You made a huge difference in so many ways with thousands of pounds of goods and bags and bags brought in every week. I wish I had space for everyone’s photos. But, you know who you are! Just this week we got so many more loads of clothes, school supplies, medical items, shoes and more. I think most of it will be headed to the orphanage. Every bit helped more than you know! Gracias!